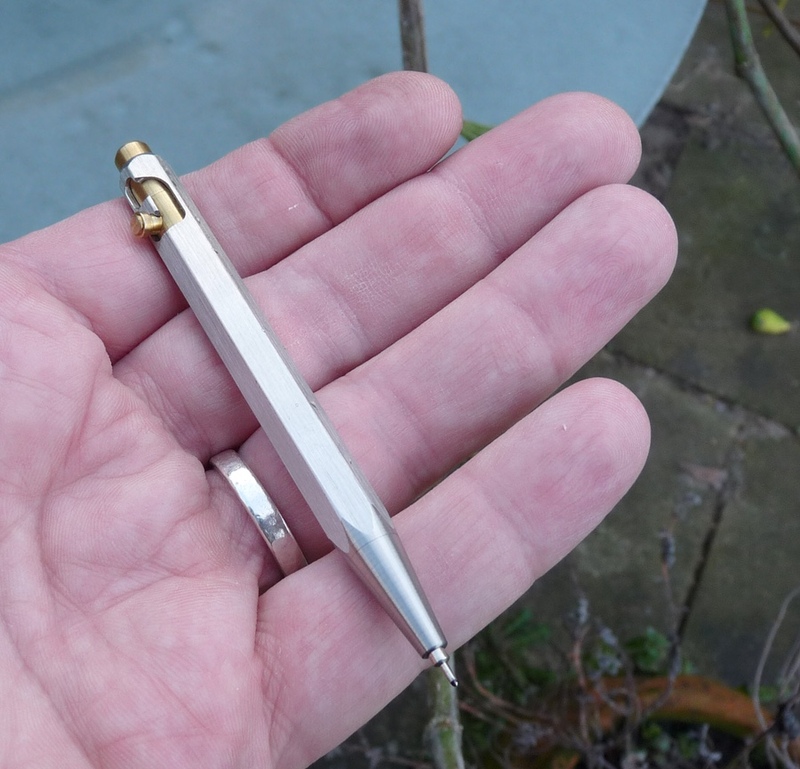 Blank Forces Pocket Bolt Ballpoint Pen Review – Pens! Paper! Pencils! This summer I was running a guest house for the first time. Summer by the seaside is a busy time and in between cooking bacon and servicing rooms the beach and the sea calls to you. I spent little time luxuriating in different fountain pen nibs and interesting inks and instead got down to basics and practicality. Without sacrificing quality, obviously. In amongst all the hurly burly one pen was used infinitely more than any other. That pen was this one, the Blank Forces Pocket Bolt. The Pocket Bolt is available in a range of options. 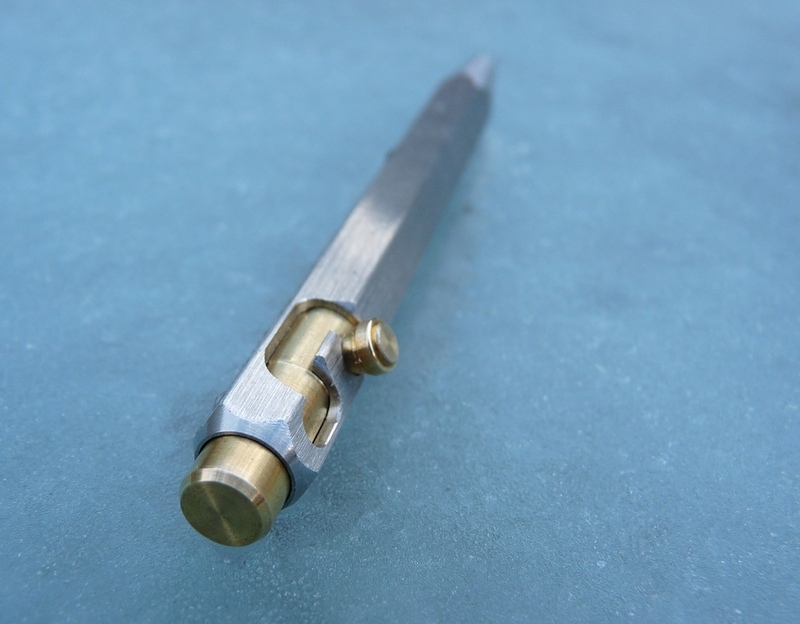 My version is clipless and made with a hexagonal stainless steel barrel and a brass bolt and thumb-stud. Alternatives include a brass barrel and/or a stainless steel bolt and thumb-stud; engraving (a choice of two designs); a key chain ring; and a clip. The supplied refill is reasonable. It’s a fine ballpoint that writes smoothly and consistently, although I would like the ink to be a little blacker. It’s changed by unscrewing the tip. 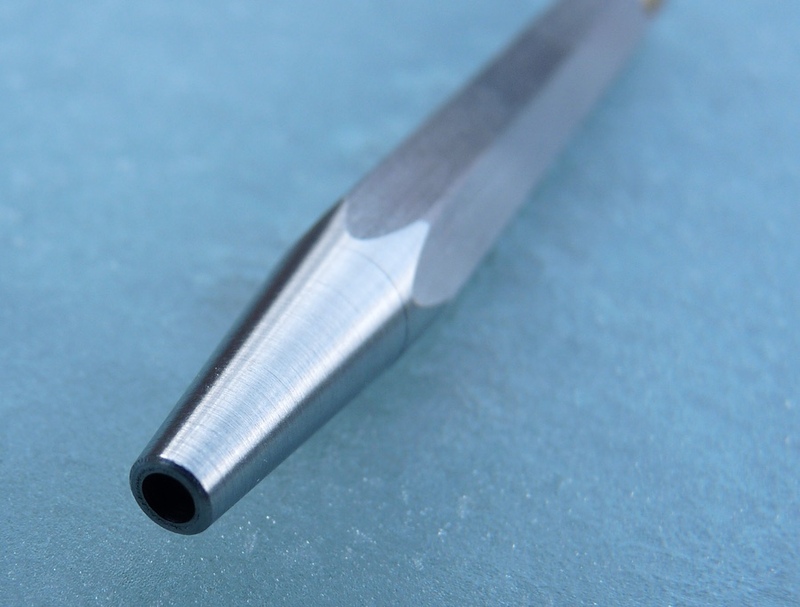 (The O-ring inside the tip section holds it in place securely and so it doesn’t come undone in your pocket.) The refill is a standard D1 size meaning there are many options. The bolt action works well. When I first received the pen it was a little stiff but it didn’t take long for it to bed-in and work smoothly. 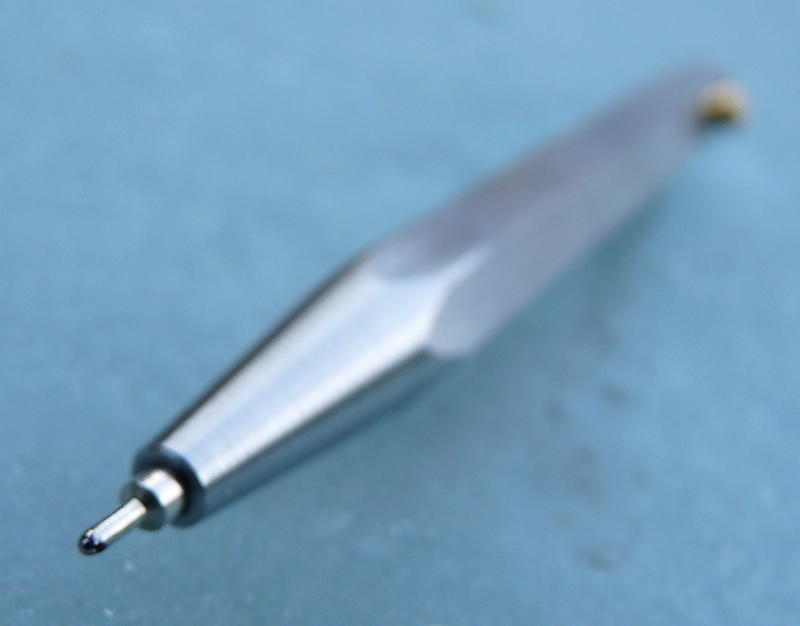 It’s easy to deploy and retract the pen using one hand and once deployed the tip is held securely with no unpleasant wobbles. Construction is to the usual Blank Forces high standard. The pen has a feeling of quality. It’s quite dense, making it feel solid, but because it’s small it isn’t too heavy. My version is robust and far from flashy but one of the etched options makes for a little more class, if that’s what you’re after. Many “Every Day Carry” pens are utterly impractical for actually carrying around every day but instead have pointy bits and look very manly. The Pocket Bolt isn’t like that. It’s actually useful. It’s quite happy living in a pocket or a bag and it won’t upset you my accidentally deploying and covering everything with ink. Nevertheless, when you want to use it it’s quick to use. Its small size means you probably won’t want to write pages and pages with it but nevertheless it’s comfortable enough for note taking. This pen has been my most used pen for the last six months because it’s so utterly practical. Practical, but also well constructed and a little bit special. It’s available direct from Blank Forces.